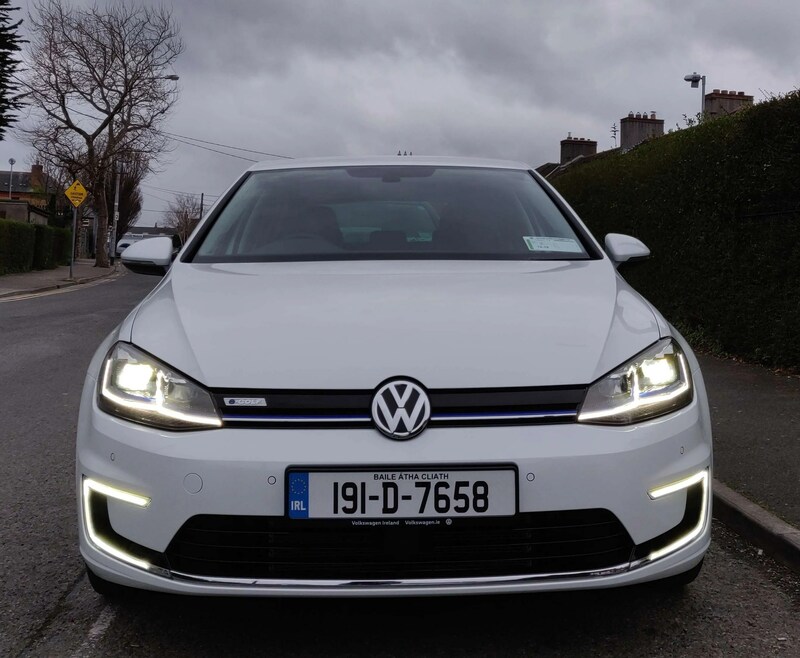 The next car in our EV review series is the Volkswagen e-Golf and we were lucky enough to test out the ‘Executive Edition’ model for a week. We drove nearly 1,000 kms in 7 days so we feel we have a good understanding of the car and what it’s capable of at this stage. 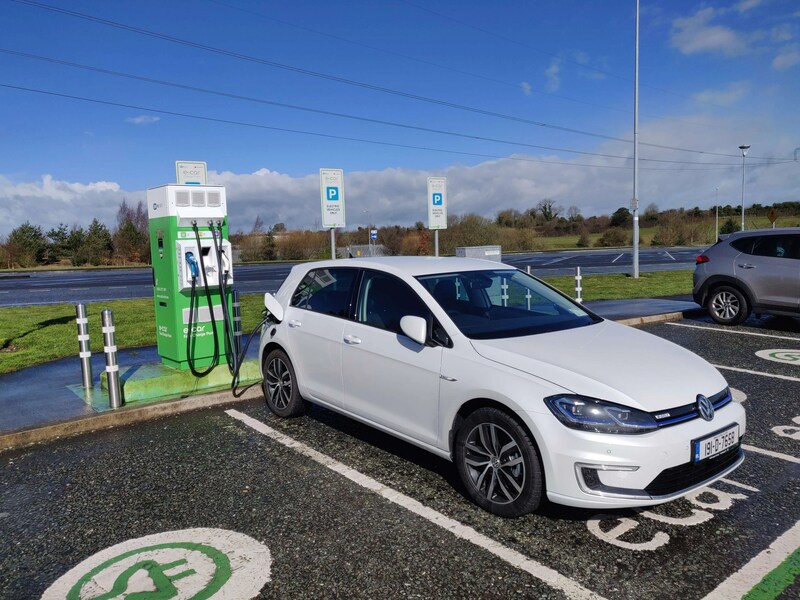 In 2018, the VW e-Golf saw the biggest increase in sales of any EV in the Irish market over the previous year (700% increase) and in 2019, it has already matched it’s sales and we are only 3 months in. This is the second generation e-Golf with an official model number from Volkswagen being the mark 7.5 (this covers all propulsion types, not just electric). The first generation of e-Golf was released in 2014 and was a very understated affair. This is going to change very quickly with the soon to be launched ID range of electric vehicles. We believe that pre-orders will start in the coming month and this is all leading to only electric models beings sold by VW by 2026. The golf is a tried and trusted design and I, for one, am a big fan. My last two personal vehicles have been Volkswagen and I love how the design of the Golf is always right on the money. It’s a classy looking car. Understated design but pure quality. 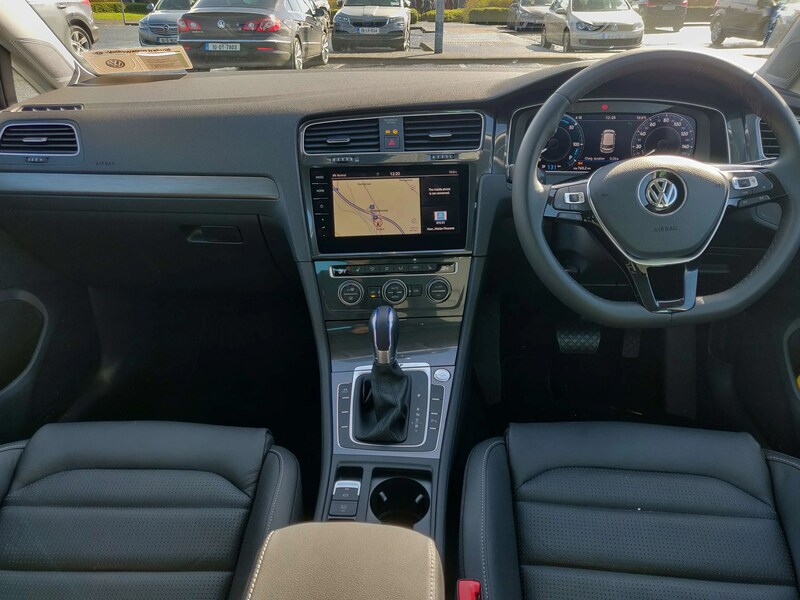 Inside and out you really cannot beat the e-Golf. It’s not shouting “I’m electric, look at me” unlike some EVs out there and I like that about it. The old advertising campaign that VW ran 10 years ago still runs true. It’s just like a golf. The “thunk” of a closing door and the build of the dash is second to none. I was worried when I thought the climate control system was malfunctioning but I soon realised that the ECO+ mode shuts every non essential system down and heating seemed to be one of them. It’s a steel car which I’m sure is hopefully great for safety but not so good for range, we’ll get to that in our range and battery section. Unlike our first review of the Nissan LEAF, the e-golf would not be as strong in this department in our opinion. The 9″ touch screen is bigger and better than the LEAF which is welcome. There are some driver aids like Adaptive Cruise Control, Front Assist, Park Assist and blind spot sensor but there’s no one peddle driving. We felt that the range estimation was closer to reality than the LEAF but again this is only our opinion. For the price of the car, we felt you could get more bang for your buck. One piece of tech we did like is the full LED lights. We really do wonder why all EVs don’t have LED lights at this stage. 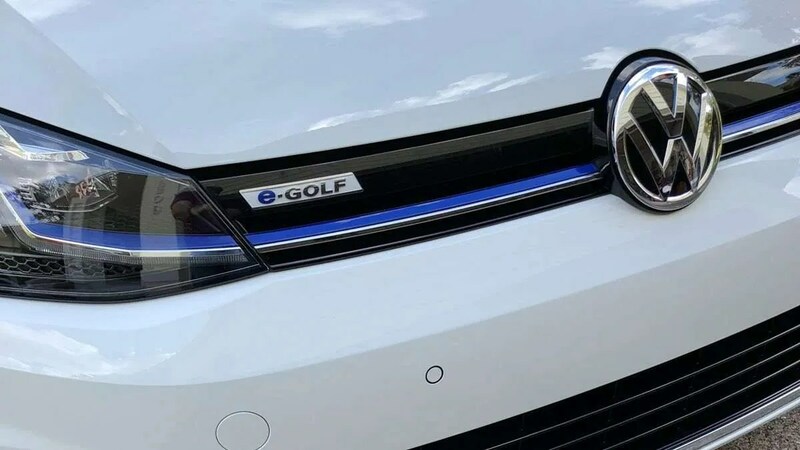 The original e-Golf was the first production Volkswagen with full LED lights and they are now starting to become the norm across a number of Volkswagen’s models, not just the electric versions. This is where you start to feel that the EV was shoehorned into an existing model which is the case and VW are not hiding this fact. The battery is starting to look small with a 35.8 kWh battery but again this a really a retro fitted model and, with the new I.D. range, we hope that Volkswagen will really up their game. It’s Golf heritage make it drive better than the LEAF. That said, as mentioned above, we felt that the range estimation was much more accurate. We drove to Cork for a conference and had to pull in twice to be sure both ways. This starts to add some time to the journey and even with fast charging, 3 out of 4 times, we managed to fast charge but we were waiting for an hour on the slower charge the 4th time and then another hour when the fast charger became available. Nearly 5 hrs drive to Cork brings us back to the good old days when we didn’t have motorways. The 5 level of regenerative braking from 0, Level 1, 2, 3 and B also helps increase your range but it’s hard to judge exactly what range you will gain. The 3 driving modes are normal, ECO and ECO+ with a WLTP range of up to 230 kms. 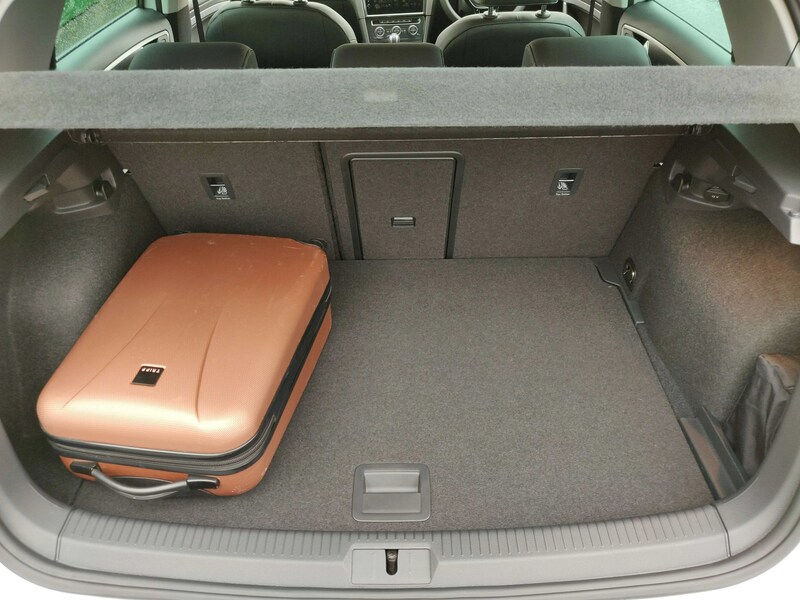 In conclusion, the Volkswagen e-Golf is a very well made and sensible car. It would be a very smooth transition if this is your first foray into the world of EVs if you already drive a ICE Golf. The range and battery size is on the small side but for zipping around the city, this is well worth some consideration. Prices start from €35,995 with Government incentives.